In response to rising costs and the large growth in the number of nontraditional students, policymakers and educators have started to examine innovative learning models as a possible solution for higher education. Competency-based education, prior learning assessments, and massive open online coursework (MOOCs) are among the types of initiatives garnering attention in the hopes that these approaches can expand access, speed time to degree completion, and reduce reliance on student loan borrowing. However, much of the federal financial aid system was designed years before many of these learning models were developed. Attempting to cultivate and implement innovative learning models within the confines of the existing federal student aid system has led to regulatory challenges, not to mention concerns over opportunities for fraud and abuse. The pending reauthorization of the Higher Education Act of 1965 (HEA), as amended, provides an opportunity to speak to these issues and take proactive steps to thoughtfully implement meaningful reforms. Identify potential future development or demonstration projects that would experiment with innovative learning models. 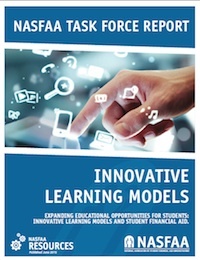 The rules, systems and processes that work for traditional, term based, brick and mortar programs do not always work to advance the innovation that currently exists within higher education, and the recommendations in this paper are the first step to help ensure barriers are eliminated that stifle this innovation.